who has a blog called Lexlimbu.com in which he posts of happenings and opportunities for Nepali locals. Thankfully Sauj made it through Sunday’s large earthquake in Nepal without injury. But, as with many of his countrymen, he is camped outside his home in a tent right now, as it’s both dangerous and scary to go inside while the large aftershocks continue. The aftershocks they are experiencing in Nepal right now are what the rest of the world would consider to be large earthquakes in their own right. We have very regular earthquakes in New Zealand – sometimes referred to as the Shaky Isles – as we straddle the Pacific and Indo-Australian tectonic plates, plus have several dormant volcanoes in our North Island that like to huff and puff now and again. Around 14,000 quakes happen in our country per year, although fortunately only around 150 are usually felt. School kids in our country are often put through earthquake drills, such is the likelihood of a large one happening in each of our lifetimes. So we in New Zealand are able to empathize with those in similar situations. To give you some idea of the severity of Nepal’s quake, on February 22 2011, we had a large earthquake in Christchurch, which is situated in our South Island. This quake was 6.3 in magnitude and killed 181 of our people. 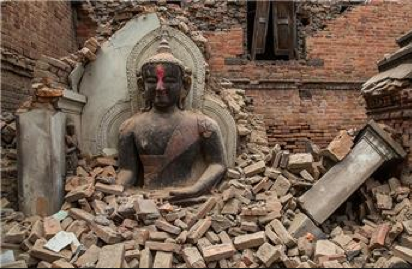 Nepal’s earthquake on Sunday was a 7.8 in magnitude and so far the death toll is over 4000, and sadly rising. Their quake was 31 times bigger than our one was, and 177 times stronger in energy released. That is a phenomenal difference, one I find it very hard to get my head around. What’s more, they also have avalanches and rock slides to contend with, plus monsoon will be on its way, bringing rain and more possibilities of landslides. I couldn’t possibly tell you what the Nepali people are feeling right now, but I do know how I felt during a 6.5 quake I experienced years ago, so maybe recounting that will help others to at least gain some idea of how it is for people in Nepal at the moment. They tell you in New Zealand that in the likely event you feel an earthquake coming, dive for a doorway or under a table. On this particular day, my very pregnant friend and I happened to already be in a doorway with my two young sons, trying to calm down another friend over the phone after we’d had a moderate-sized tremor. We were pretty blase about this ourselves, as we were used to swarms of the darned things at that time of year (March – our Autumn), and we had just been marvelling at how this one had actually made something fall off a shelf in the lounge, and a bunch of books had fallen all around my older son who had been in bed having an afternoon nap. We lived in a large old villa at the time, in which things were made pretty sturdily as they were in the old days, so I felt we were pretty protected and safe. Then the big one struck. And it turned out we couldn’t have dived for anything if we’d tried, as we were sucked to the floor by the centrifugal force of it. The sturdy things around us – solid wood door, bookshelves full of encyclopedias, large old bakelite phone – turned into enemies that thumped against us and jumped up and down above us, threatening to bash our heads in. The noise of it all was totally deafening, and all we could do was curl up into balls and be thrown around on the floor, and wait for it to end. And hopefully not finish us off in the meantime. It’s still very clear in my head what it was like. Being in a very large washing machine that was on spin cycle is the closest I can describe it. When at last it ended and we popped our heads up warily for a look around, what met our eyes was a scene of total devastation and chaos. Absolutely nothing was left on the shelves this time. If fact the shelves weren’t even left on the wall. Years of paraphernalia had come out of cupboards and off the walls and made a mess that was around knee-high, and when we waded through the lounge to the kitchen, we choked on the fumes that were coming of the foods and condiments that had mixed together in a great big scientific experiment on the floor. In the other lounge, the iron-framed piano had bounced across the floor, bashed against the pool table and fallen back against the wall. The solid old TV cabinet had done something similar. An eerie whistling wind swept through the house, opened and slammed all the windows, and in the ensuing silence we could hear the water in the big concrete tank outside going ‘swish……………swish…………’ We scooped up the kids, the dog and the lovebirds and got the heck out of there. It was hard to find somewhere that was safe to sit, that wasn’t near a wall or a power line, or a dish hole in the paddock (we lived on reclaimed land and every year a new hole would appear somewhere on the land, created by underground rivers). In the end, we sat on top of a silage stack, which would have made a weird picture – two women, one heavily pregnant and the other with two little kids, sitting on top of a hill made of rotting grass, holding a birdcage. I prayed so hard that I probably made God jump, that my friend wouldn’t go into labour. As one of my little boys sat on my lap, his legs fluttered like paper in the wind – he was absolutely terrified. It turned out that we were lucky. It had only affected a relatively small area around us, and there were no cities in our region. There were only two deaths, and if I remember rightly they were due to heart problems, or similar. Very few people were badly injured. The worst part of it all was the psychological effect on us all. This went on for many months, and as for my poor scared little boy, he couldn’t sleep alone for months, and even then always had to have the light on. My other son was fortunate – at around one year of age, he was too young to remember much about it at all. Aftershocks that go on for weeks or months. You don’t know, and nobody can tell you, if they’re truly just aftershocks or another earthquake building up. Sleep deprivation. You sleep in fits and starts, jumping at every little noise, poised to leap into a doorway if the shaking of each aftershock seems to be building. Lack of fresh water. Broken sewerage pipes and septic tanks seep into local rivers, streams and water supplies. The next biggest danger aside from another large quake is typhoid, from polluted water supplies. Access to food. How long before your supplies run out? How long before shops can reopen, if at all? Transport. Roads and bridges are out, making it difficult or impossible for supplies to be brought into your area, or for you to get out and about. Contact. Phone lines and internet are down for an interminable amount of time, leaving you wondering if those you love and know are okay, and others outside wondering if you’re okay. Weather. It’s often far too dangerous to go back into buildings, leaving you at the mercy of the elements. Hyper-awareness. Every little noise could possibly be the beginning of a rumble, bringing with it another earthquake. These are just a few of the things that the Nepali people will be going through right now. Add on top of that the anguish of not being able to find loved ones, and grief at having lost many. I know this doesn’t do anything to help the Nepali people right now, but I hope it helps others to understand, at least to a small degree, what they are living with and what they will be facing for a long while yet. So please, if there’s anything you can do from your little corner of the world, whether it’s to donate money to the Red Cross, or collect goods to send or sell for donations, or just keep them in your prayers, please do it. Right now they need every bit of help they can get. This entry was posted in Nature, Random Factoids & Stuff, Ravings - random wafflings, Travel and tagged Earthquake April 2015, Earthquake experience, Help Nepal, Nepal, Nepal Earthquake, Pray for Nepal. Bookmark the permalink.